Note: This product can only be shipped Ground Delivery. 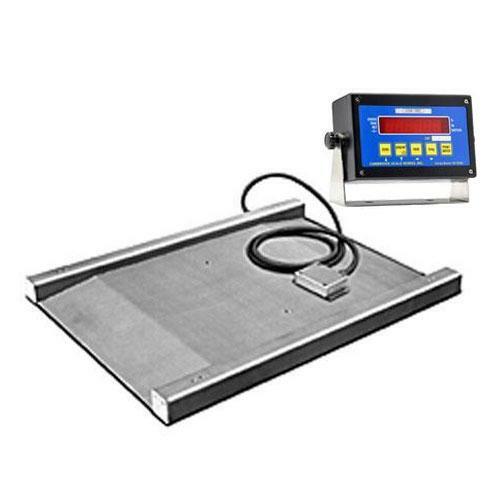 Constructed of structural tubular stainless steel and heavy gauge smooth plate decking these scales are designed to handle the toughest washdown applications. Incorporating all of the accuracy, reliability and strength you have come to expect from Cambridge Scale Works and backed by our one year warranty. Structural tubular stainless steel construction. Heavy stainless steel deck plate. Eye bolt holes allow easy set-up. Shielded load cell and indicator cables. Ultra-low profile (1.5” above the floor). Live side rails to weigh oversized loads. Live built-in easy incline ramps. NTEP certified-5000 Division, Class III/IIIL, IP 67 water resistant rated stainless steel shear beam load cells. Remote stainless steel NEMA 4x junction box. Stainless steel diamond deck plate. Type 316 Stainless steel construction. “FM” approved and hermetically sealed stainless steel load cells (available with Teflon cables). High Resolution Package Includes: Captive ball leveling feet for unmatched stability. Captive ball leveling feet for unmatched stability. (4) Internally mounted, Environmentally protected, NTEP certified-5000 Division, Class III/IIIL, IP 67 water resistant rated stainless steel shear beam load cells. Sturdy stands ideal for the secure mounting of your valuable indicator. Feature adjustable leveling feet for a wobble free stance on almost any floor environment. Stainless Steel construction, rigid 48 inches high.